In November I travelled to the University of Tehran to speak at Iran’s first ever Shakespeare Conference, held at the Faculty of Foreign Languages and Literatures. The conference was titled ‘Not of an Age but for All Ages’, and its theme was on how Shakespeare crosses boundaries of time and place. My paper was on King Arthur and Shakespeare. I wanted to speak on this subject because I was fascinated by how the figure of Arthur fits into different contexts, and a Shakespeare conference in Iran seemed to be an interesting context to consider. I’ve written separately about the content of my paper, and my experience of the wonderful conference, here. 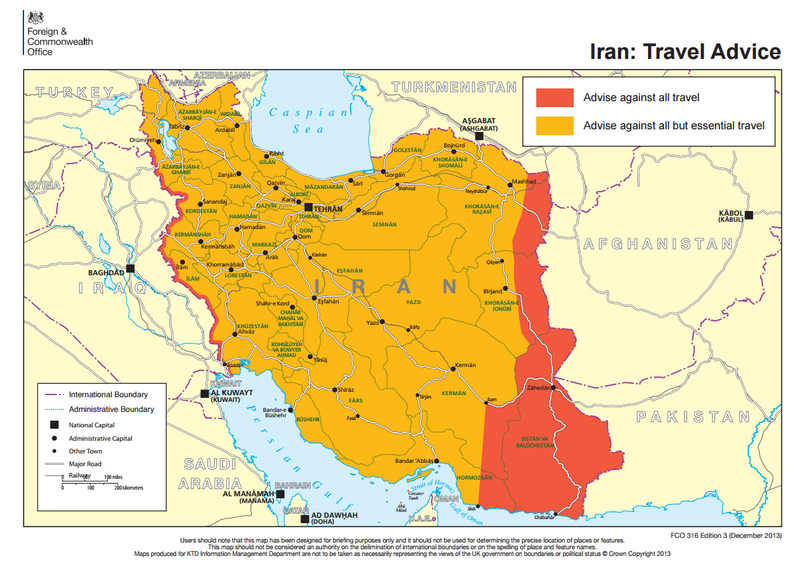 This post will be about my adventures in Iran. I didn’t know a lot about Iran before I went there. I have travelled in the Middle East before — I’ve made a few trips to Egypt and Jordan — but I knew Iran would be very different. Iran felt like somewhere dangerous to go. In fact, the Foreign Office website covers Iran in orange with a bit of red around the sides. The orange stands for ‘Don’t go unless your life depends on it’. The red stands for ‘Abandon hope all ye who enter’. At the same time, I knew that Iran wasn’t ‘enemy territory’. 78 million human beings live there. I’m a human being. I’ll fit right in! I was also going with a friend — fellow DPhil student William Badger — who is strong and tough, and has had experience in dangerous situations before. He’s basically Batman. In the end, I felt completely safe in Iran, and thought it was a wonderful country to visit. Getting my Visa was a little difficult. I had to go to Dublin as the London Embassy still hasn’t re-opened since the attack in 2011. For a long time I only knew that my visa was being ‘processed’. A few weeks before the conference was scheduled, I was told the processing was over, and I could book an appointment at Dublin to finalise it. I ideally wanted to go to Dublin at the same time as my friend Will, but his visa was still delayed, probably because he’s an American. I left it to a week before the conference and then flew over to Dublin on my own. Will eventually got his approved a few days later and flew over to Dublin to pick it up the day before we flew to Iran! Picking up the visa from the embassy turned out to be quite easy. I was helped by Professor Mark Burnett, from Queen’s College Belfast, who was also speaking at the conference, and who helpfully contacted me in advance to give me tips on how to get the visa. The consulate staff were friendly but professional. It was actually less stressful than getting my visa for America, back when I was a student there, as the American embassy staff can be quite fierce! When Will and I got to Turkey, we bumped into Professor Burnett in the airport. He was as lovely in real life as he seemed in his e-mails, and it was good to meet someone in the same boat (or rather, plane) as us. When we got to Tehran we had a little trouble getting through security — there was a lot of discussion about Will’s American passport and we didn’t have a proper accommodation address — but they let us through eventually. Again, it was easier and more pleasant than going through American security! Even though it was past midnight we were still met at the airport by one of the conference organisers, and a driver, who took us to our guest house. Professor Burnett stayed behind to wait for Stephen Greenblatt, who was also speaking at the conference. Our guest house was basic but comfortable. I really liked the lobby and the restaurant because people would come up to talk to us. One person we met was from China, studying Persian literature at the university. I think she was happy to speak to people in English. Her boyfriend, who sat some distance away, staring at us with crossed arms, didn’t seem so thrilled. Another nice person we met was an Iranian father who was in the area visiting relatives in hospital. Even though he was there in sad circumstances he was very pleasant to chat to. When we saw him the second time he offered us walnuts from a brown paper bag. He was eating them as if they were sweets. After the conference we had the chance to tour the country a bit. We went to Esfahan, Kashan, Shiraz, Abyaneh. Pasargadae, and Persepolis. We then flew back to Tehran to catch our plane home. What can I say about the places we went to? They were all extremely, heart-achingly, beautiful. The people were all friendly. The food was, without exception, delicious. My favourite place? I loved Esfahan as a city. We spent quite a lot of time in Naqsh-e Jahan Square, which is surrounded by mosques, palaces, and a bazaar. We had some good conversations with local people there, although these conversations usually led to invitations to visit their carpet shops around the corner! I also loved Perseoplis. I’ve been lucky enough to go to some amazing places — the Egyptian pyramids, Petra, the Great Wall — but Persepolis was the best ancient site I’ve ever seen, partly because it’s all in one place (unlike Petra, which is spread out), and partly because it was so free of crowds. As I walked around I kept on thinking ‘Why is this happening to me?‘ It seemed impossible that somewhere would be so beautiful and I could just be allowed to walk around it. I couldn’t take it in. One of the best things about my trip was meeting Iranian students of English Literature. I still keep in touch with a few of then. We discuss our work with each other, and learn about each other’s culture.